The Easter bunny is hopping over in just a few days, can you believe it?! Where did the winter go? 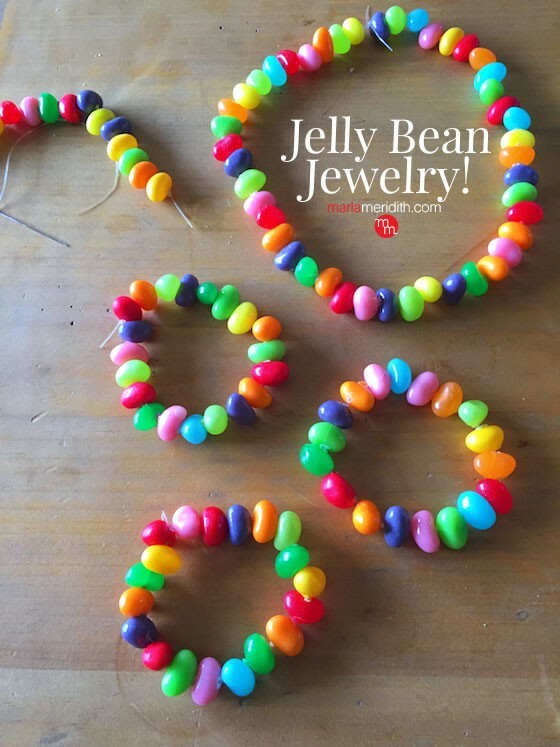 We’ve been experimenting with all kinds of edible Easter crafts & this Jelly Bean Jewelry has won the hearts of my kids and myself! This craft is super easy & is a festive way to display your love of the season. Besides, when you are craving a sweet snack you can eat the jelly beans! Follow me on Snapchat at @marmeri where I will be sharing loads more Easter inspo! Please don’t forget the Peeps Play Dough craft I posted earlier this week. That’s really fun too! Here’s a project video which includes the snaps I shared. Cut a length of cord appropriate for a bracelet or necklace. Have a little extra length for knotting and tying. Start “sewing” the jelly beans through the centers, making a strand long enough to wear. When you have a long enough strand, tie the ends together. What a fun idea and i bet the kids would love to do this on Easter with all their candy! These are SO cute!!! my kids would love them!